In the beginning, FaceTime brought video calling to the iPhone 4. It was iPhone 4-to-iPhone 4 only and required Wi-Fi (not cellular 3G or 4G). Still, it was pretty cool and worked quite well. Not surprisingly, it soon spread to the second- and later-generation iPads, the iPod touch, and in OS X Snow Leopard on the Mac as well. One of Messages features is video chat. Alas, Messages can video chat only with folks on Macs or PCs, but FaceTime lets you do video chat with other Mac users as well as users of iPhone 4 or later, as well as iPad and iPod touch users. 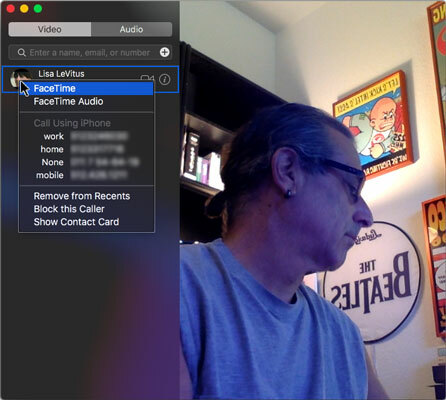 In addition to its aforementioned video-chat-with-iDevices prowess, FaceTime works beautifully for Mac-to-Mac video calls. And, because it’s a single-purpose application, many users find it easier and less intimidating to set up and use than Messages or Skype. By the way, there’s no Windows version of FaceTime at the moment, so you’ll have to use Messages (or third-party software like Skype) to have cross-platform video chats. A feature introduced in Yosemite lets you use your Mac to make and receive phone calls on your iPhone with the FaceTime app. To get started, launch FaceTime from your Applications folder, Launchpad, or Dock. The main (only) FaceTime window appears, as shown here. The FaceTime window, ready to make a call. The right side of the window shows what your Mac’s camera is seeing. Clicking the camera icon next to someone’s name initiates a call from the Mac to a contact’s iPhone (or Mac). This person was in the yard, so she answered on her iPhone. 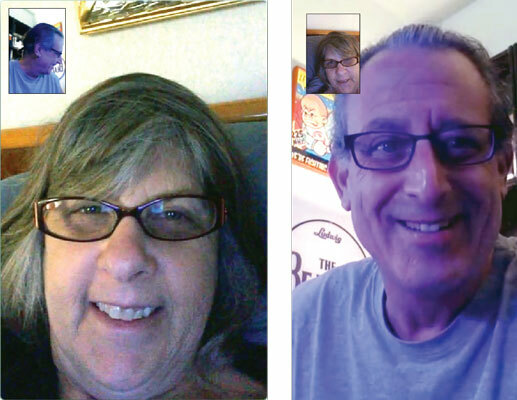 A FaceTime call: what the caller sees on a Mac screen (left) and what the call receiver sees on an iPhone screen (right). FaceTime uses Contacts, so if you have friends or family who have an iPhone 4 or later, iPad 2 or later, iPad mini, iPod touch (fourth generation or later), or a Mac, just type their name in the field in the top-left corner, and then right- or Control-click on their name in the results list, as shown for Lisa LeVitus here.